NES Super Mario Bros. (PRG0) "warpless" in 18:57.73 by Phil & Genisto. 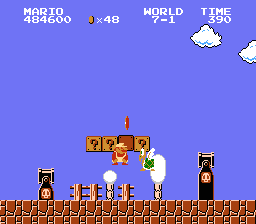 This movie is a full run-through of Super Mario Bros., using no warps. The authors have tried to show off as many bugs as possible and otherwise entertain the viewer without losing time.